The Guardian Children's Fiction Prize was founded in 1967. It is awarded annually to fiction written for children aged eight and above, and is the only children's fiction award selected by fellow writers. The judging panel is chaired by our very own expert reviewer, Julia Eccleshare who is also the Children's Books Editor of the Guardian. You can find the winner and all 7 other titles on the 2016 short and longlist below. Crongton Knights is a very funny, very moving story that shows that although life is testing, the lessons learned the hard way are the ones you'll never forget. It is from the acclaimed author of Liccle Bit. 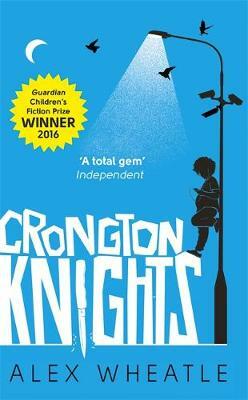 STOP PRESS 18 November 2016... Crongton Knights written by Alex Wheatle has won the Guardian Children's Fiction Prize 2016. This year’s prize will be judged by author and winner of the 2015 prize, David Almond, and authors Kate Saunders (author of Five Children on the Western Front, which was shortlisted for the prize in 2015) and SF Said (author of Varjak Paw, The Outlaw Varjak Paw and Phoenix, which was shortlisted for the Guardian children’s fiction prize in 2014) and chaired by Guardian children’s books editor and Lovereading4kids editorial expert, Julia Eccleshare. The Guardian children's fiction prize is shadowed by a Young Critics scheme in which children have their say on the longlisted books. If you are aged 17 or under and love reading, there is a The Young Critics competition where you can submit your own review of one of the books in the longlist. The deadline has now passed but you can find more information here. Previous winners of the prize include Mark Haddon for The Curious Incident of the Dog in the Night-Time, Northern Lights by Philip Pullman, How I Live Now by Meg Rosoff, The Illustrated Mum by Jacqueline Wilson, Frank Cottrell Boyce with The Unforgotten Coat and Piers Torday with The Dark Wild.